Five captains took out 20 members of the Oakwood Striper Club meeting at 5:30am Saturday morning at Oakwood Bait and Tackle. Most boats launched at Old Federal park and headed out in different directions. My boat captain Shaun took us to the mouth of Young Deer creek. As soon as he cut the big motor we were surrounded by Stripers. Not being ready to put out the spread of downlines we quickly moved past the school. Circling back and ready, a Striper nailed the rod I was manning. After a long fight the Striper broke off the leader. I baited back up and set the depth of the Downline to 30′ again. 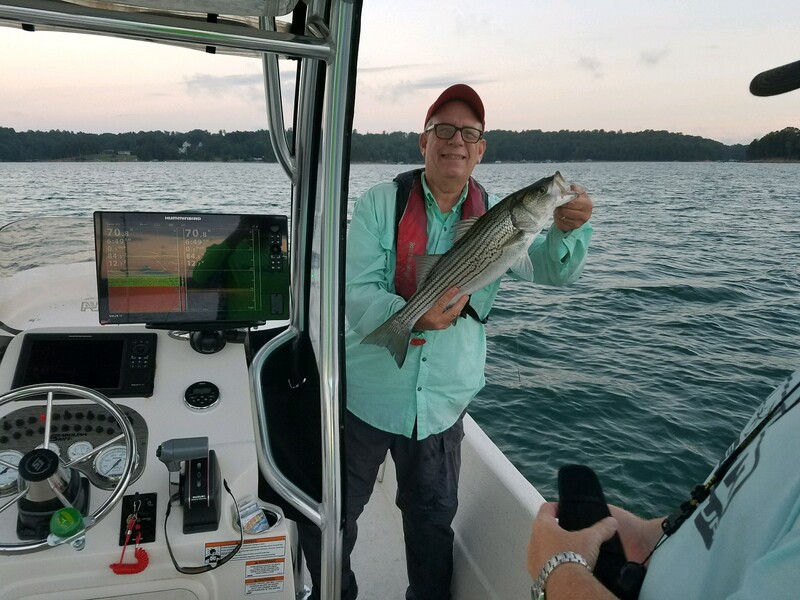 After just a few minutes another Striper hit my line and it was Fish On, again. I did get this one in. Captain Shaun shared our catch with the other captains inviting them to get on the school. As quickly as the others could come by the school of Stripers moved on. After fun fishing until noon, all boats headed back to OBT to share stories and have venison burgers from the grill thanks to Dillon Greeson, owner of OBT.